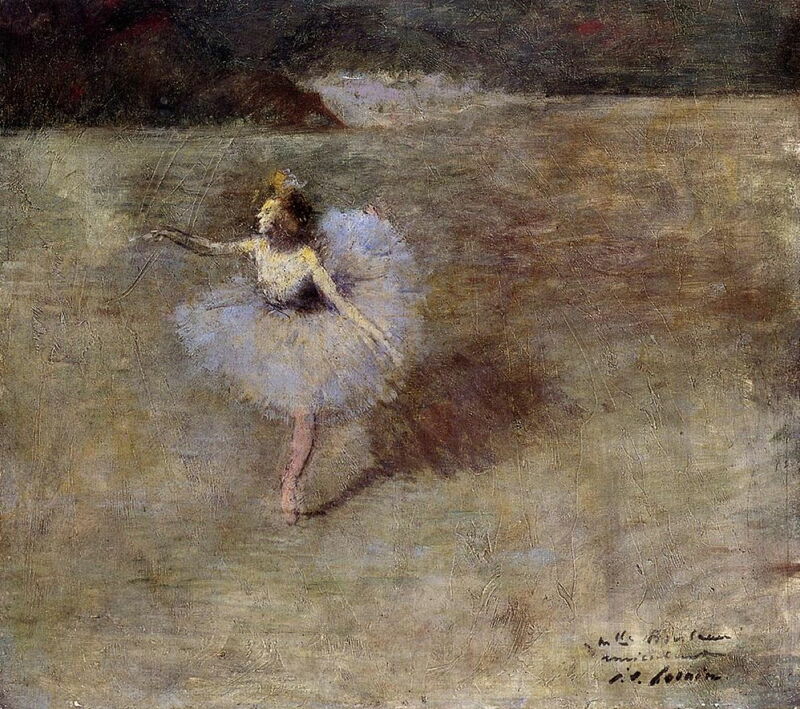 In the previous article, I looked at a selection of paintings showing the ballet and its dancers during the lifetime of Degas, to help put his many paintings and drawings into context. The works shown concentrated on the more innocent aspects of ballet at that time, although some strayed a little towards voyeurism, even becoming mildly exploitative, perhaps. 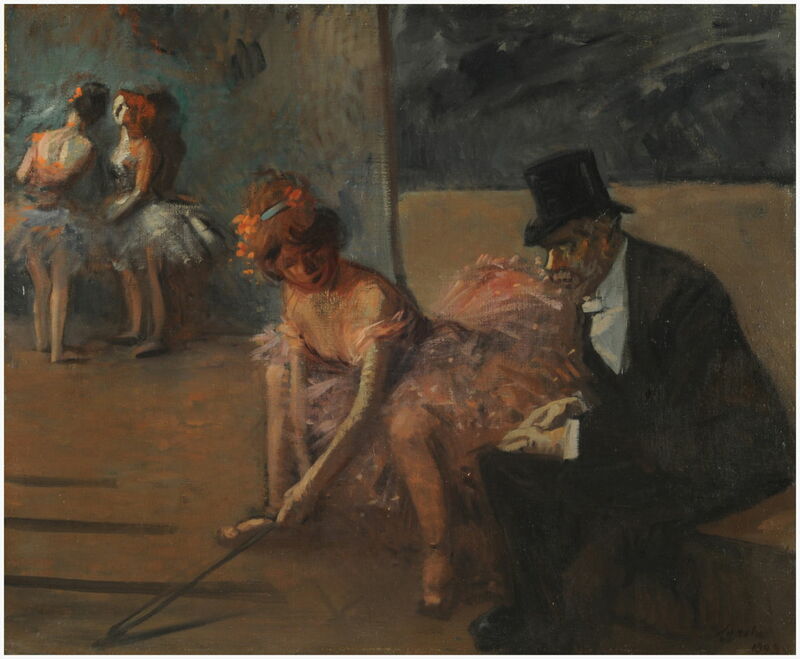 There is a darker thread which runs through many of Degas’ depictions of the ballet: older men lurk in the shadows in the wings (les coulisses) to spend time with the very young girls. Degas hints at the open secret of child prostitution. The other artist of the day who conveyed the same message in his paintings was a follower of Degas, Jean-Louis Forain (1852–1931). 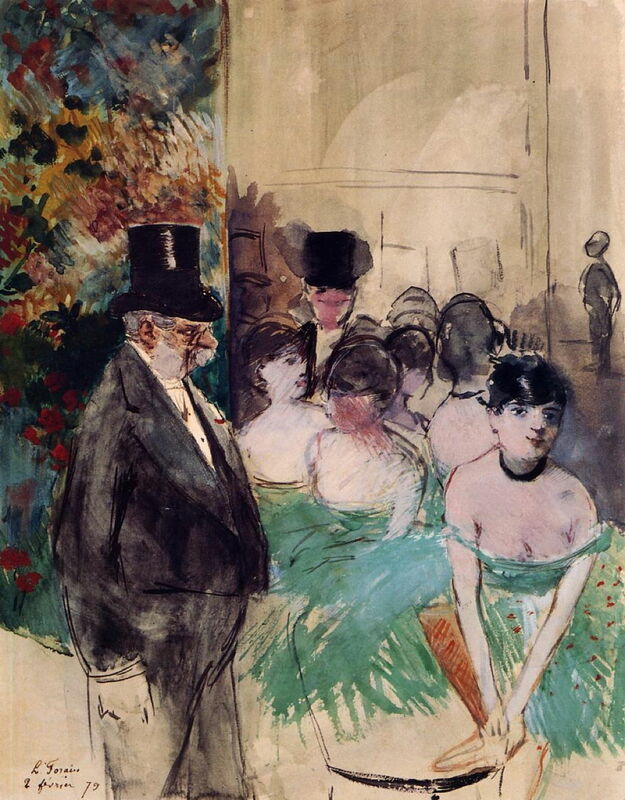 Forain was often the youngest person to engage in the intense discussions between Manet, Degas and others in the Café de la Nouvelle Athènes in Montmartre, and was admitted to the Impressionist movement when he exhibited in the fourth Impressionist Exhibition in 1879. Forain’s major influences were Degas and Daumier, and he shared the latter’s incisive visual wit, working as an illustrator for satirical magazines. He remained a loyal friend to Degas until the master’s death. Jean-Louis Forain (1852–1931), Dancer (date not known), further details not known. Wikimedia Commons. Forain’s undated and barely-titled paintings of Dancer (above) and Dancer in Pink Tights (below) come without any social message. 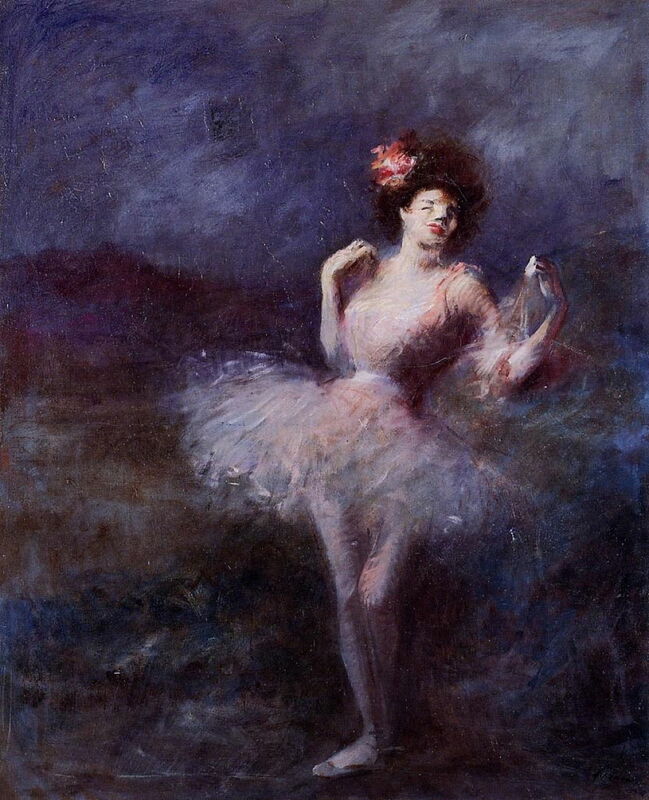 Jean-Louis Forain (1852–1931), Dancer in Pink Tights (date not known), further details not known. Wikimedia Commons. Jean-Louis Forain (1852–1931), Dancers in Pink (date not known), further details not known. Wikimedia Commons. 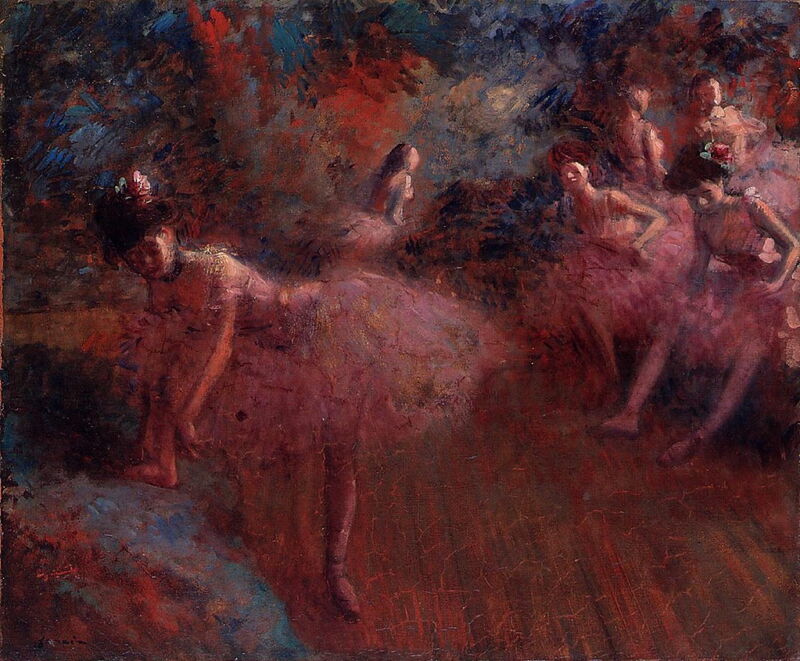 Once he moves into the wings, though, Forain enters that darker world – subtly in the undated Dancers in Pink (above), then more bluntly in his surprisingly early painting of an Intermission on Stage (1879) below. 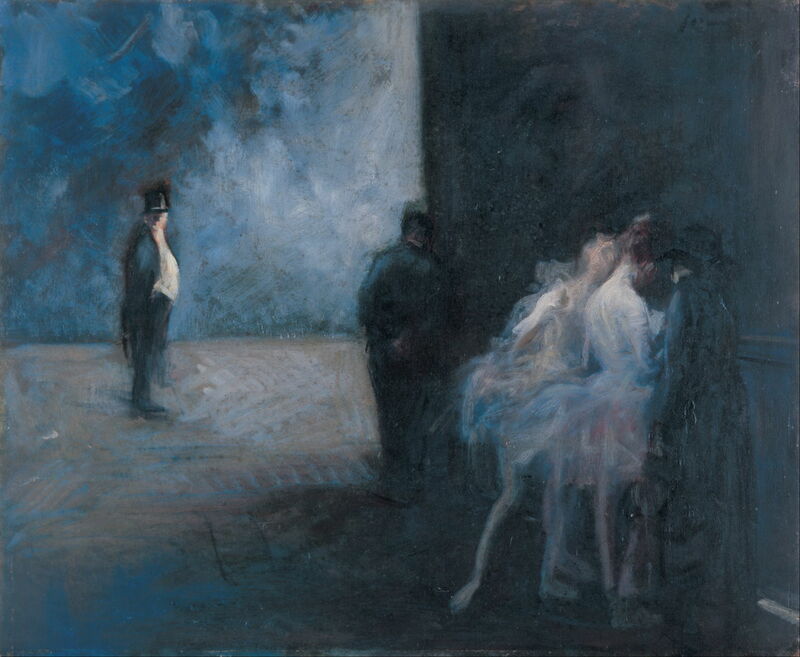 Jean-Louis Forain (1852–1931), Intermission on Stage (1879), media and dimensions not known, Dixon Gallery and Gardens, Memphis, TN. Wikimedia Commons. 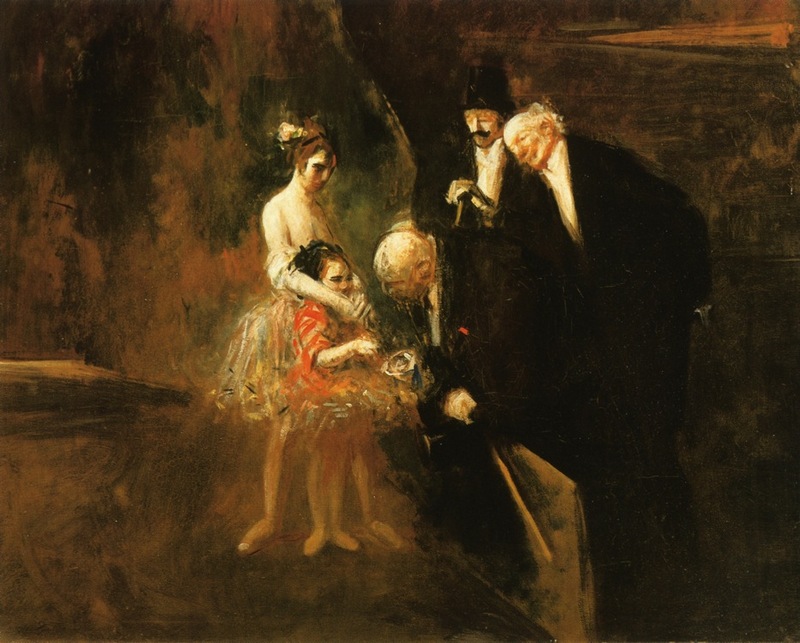 Forain’s increasingly sinister series of paintings of the ballet off-stage make the villains very recognisable: those well-dressed, affluent, older men in their top hats and white gloves, sometimes smoking a fat cigar. You know instantly that the bouquet is not in recognition of her dancing skills. Again, the top hat and white tie give his game away, but it’s one that the young dancers try to exploit too. Those men are there again, lurking in the shadows in the depths of the building, hunting dancers. Such young girls too, in the trust of their elders, who had already succumbed, no doubt. 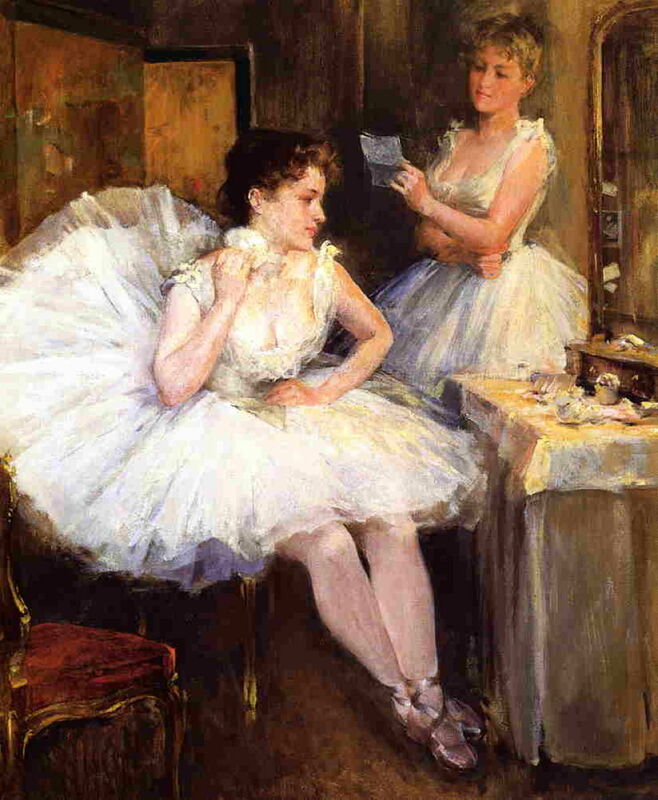 Willard Metcalf (1858–1925), The Ballet Dancers or The Dressing Room (1885), oil on canvas, 61 cm × 51 cm, Private collection. Image by Rlbberlin, via Wikimedia Commons. Willard Leroy Metcalf was an American painter who trained in Europe between 1883-88, spending much of that time in France. He must have visited the Paris Opera Ballet, and there painted the more gently voyeuristic The Ballet Dancers or The Dressing Room (1885). 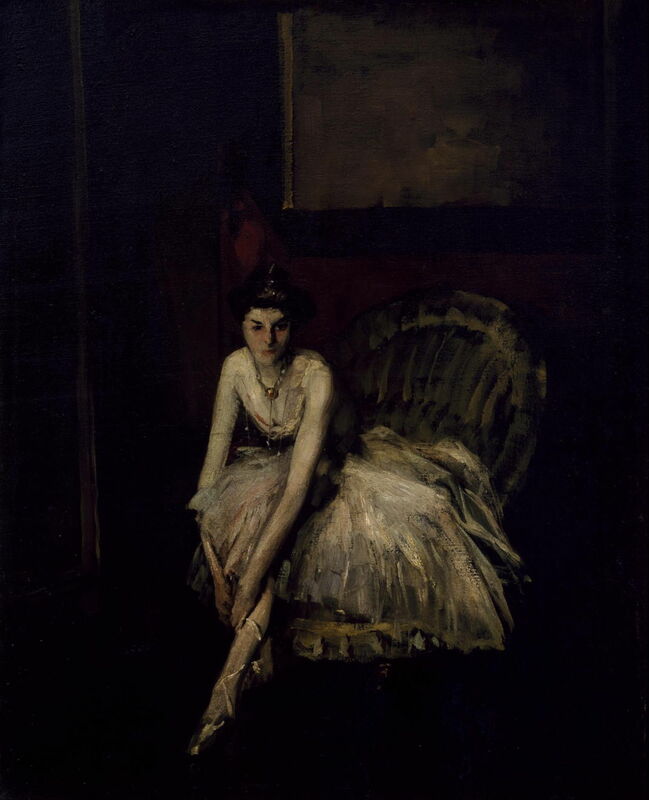 Robert Henri was another American who spent time in Paris; I do not know which side of the Atlantic provided his motif in Ballet Dancer (1901), but she is far from the bright lights and applause. Perched on the edge of striped armchair, she looks gaunt and tired, and the room around her is dark and dingy. Robert Henri (1865–1929), Ballet Dancer (1901), oil on canvas, 81.9 x 85.1 cm, Museum of Fine Arts, Houston, TX. Wikimedia Commons. 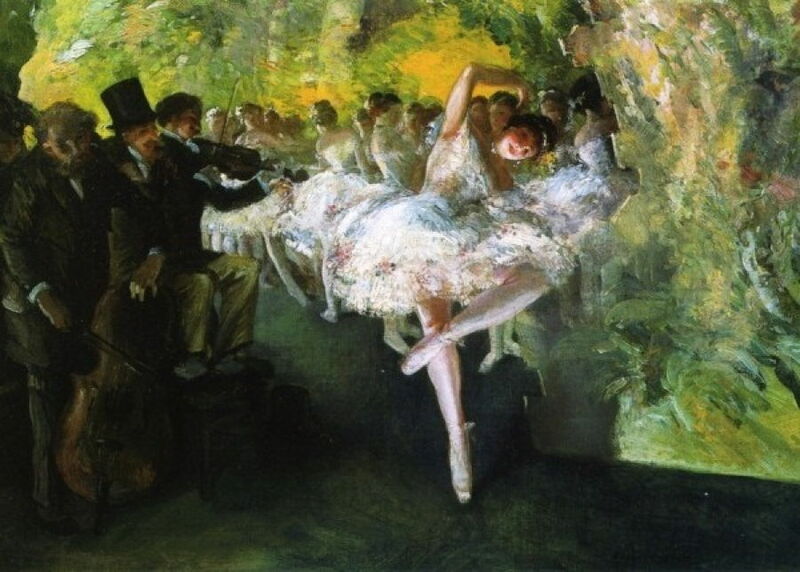 Everett Shinn (1876–1953), The White Ballet (1904), oil on canvas, 74.9 x 93.3 cm, Smithsonian American Art Museum, Washington, DC. Wikimedia Commons. Everett Shinn was also a member of the Ashcan School, an American who painted gritty images of the streets of New York and London. He travelled in Europe, apparently seeing works by Degas among others. 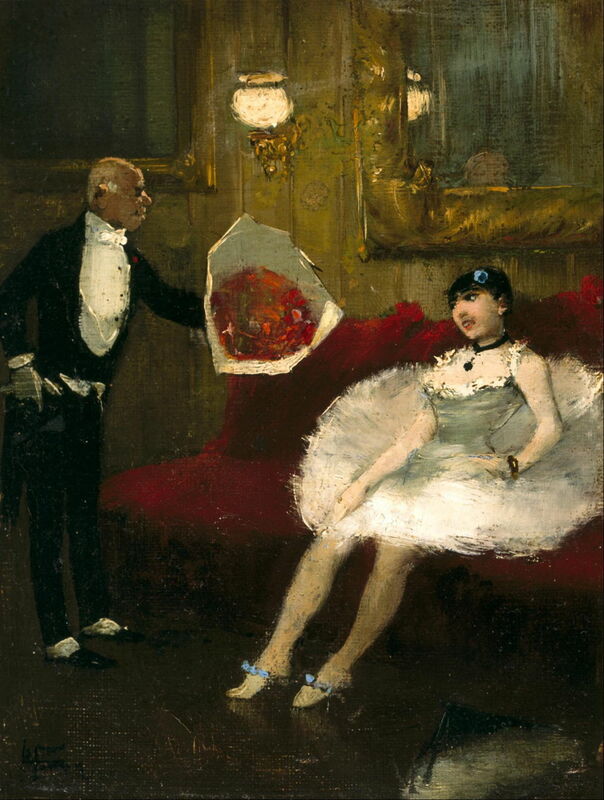 In the early years of the twentieth century, he painted several scenes in theatres, including a couple at the ballet. Among those are The White Ballet (1904), above, and Rehearsal of the Ballet (c 1910), below. 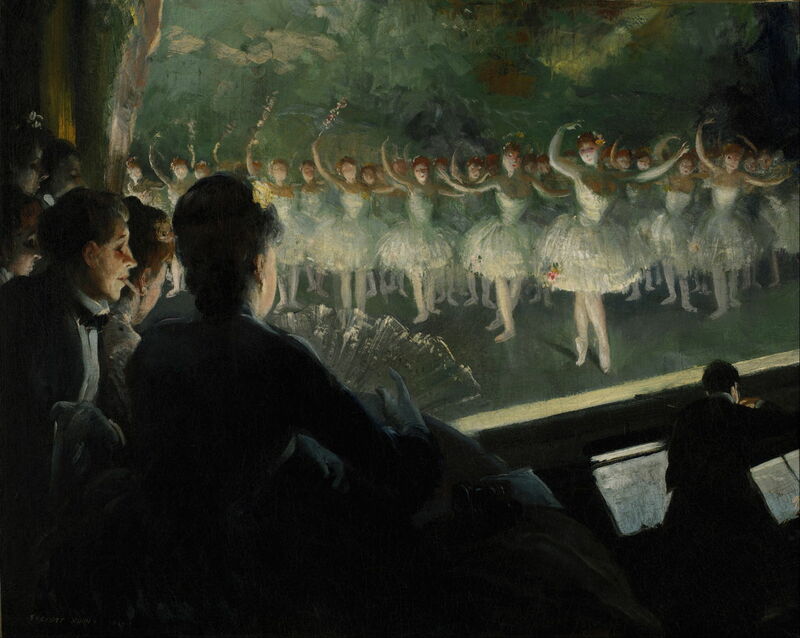 Everett Shinn (1876–1953), Rehearsal of the Ballet (c 1910), further details not known. Wikimedia Commons. Beware of smart older men in top hats who ‘just want to talk’. Posted in General, Life, Painting and tagged ballet, dancer, Degas, Forain, Henri, Metcalf, painting, Shinn. Bookmark the permalink. Great read. What was your inspiration for this post ? This is part of my build-up to covering Degas’ paintings of the ballet. Interestingly, at the same time in London, there was a big scandal about child prostitution, which Watts covered in his painting of the Minotaur.